The burger looks, tastes and smells like beef — except it's made entirely from plants. It sizzles on the grill and even browns and oozes fat when it cooks. It's the brainchild of former Stanford biochemist Patrick Brown and his research team at Northern California-based Impossible Foods. The startup's goal is like many in Silicon Valley — to create a product that will change the world. "The demand for meat is going through the roof, and the world is not going to be able to satisfy that using animals — there's just not enough space, not enough water," says Brown, Impossible Foods' founder and CEO. Global meat production is expected to increase by 612,000 tons, or 1 percent, this year, according to the United States Department of Agriculture. It's not the only faux meat company selling bloody plant patties. 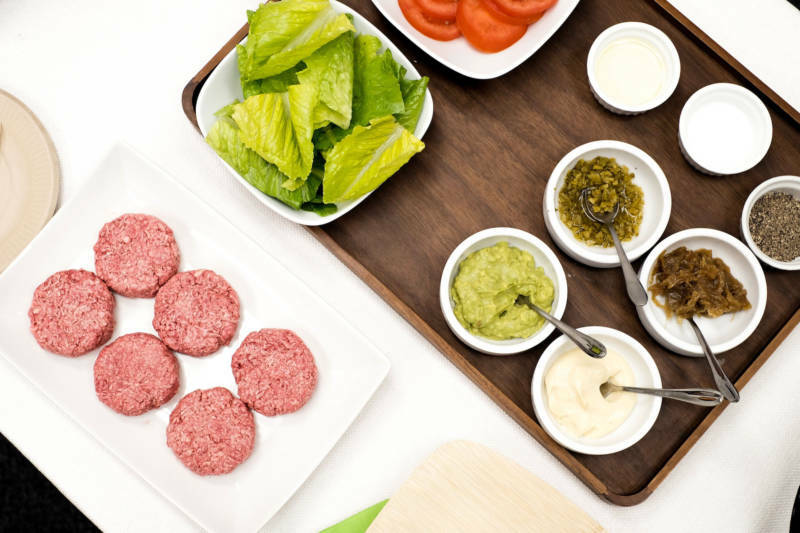 Last month, Los Angeles-based Beyond Meat made headlines when it released the Beyond Burger, its pea protein burger that sizzles like real meat and "bleeds" beet juice. The burgers quickly sold out after debuting at a Whole Foods in Boulder, Colo. Beyond Meat's investors include Microsoft founder Bill Gates. Gates is also backing Impossible Foods. So is billionaire venture capitalist Vinod Khosla and Google Ventures. All told, the company has raised some $182 million in seed funding. Last year, Impossible Foods turned down Google's offer to buy the company for $200 million to $300 million. The Impossible Burger is more than just peas and carrots smashed together: It's the result of some pretty high-tech research. Brown's team analyzes meat at a molecular level to determine what makes a burger taste, smell and cook the way it does. He wants his burgers to be squishy while raw, then firm up and brown on the grill. He believes everything from an animal's fat tissue to muscle cells can be replicated using plant compounds. Before starting the company, Brown had a hunch that a certain ingredient made meat taste different than other foods. "I had a very strong suspicion early on that heme would be the magic ingredient for flavor," said Brown. Heme is an iron-containing molecule in blood that carries oxygen. It's heme that makes your blood red and makes meat look pink and taste slightly metallic. It's highly concentrated in red meat, but it can also be found in plants. And that was the trick to giving Brown's meat-free burgers that blood-pink look when raw and meaty taste once cooked. Brown could have extracted heme from legumes like soybeans, which contain leghemoglobin in nodules on their roots. Except, that would have been expensive and time consuming, and unearthing the plants would release carbon into the atmosphere. So, he decided to use yeast instead. By taking the soybean gene that encodes the heme protein and transferring it to yeast, the company has been able to produce vast quantities of the bloodlike compound. Each vat of frothy red liquid in the lab holds enough heme to make about 20,000 quarter-pound Impossible Burgers. "We have to be able to produce this on a gigantic scale," says Brown. "Ultimately, we want it to be practical to produce enough of our product to match what's currently consumed in the U.S. or the world. Well, that's a lot of heme," he says. Because Impossible Foods isn't targeting vegetarians; it wants to woo carnivores. Brown thinks meat lovers would opt for veggie patties more often if they had an option that really replicated the burger-eating experience. So he's trying to pin down what accounts for the mouthfeel of beef. To replicate fat, researchers mix flecks of coconut oil into ground "plant meat" made from textured wheat protein and potato protein. The potato protein provides a firm exterior when the meat is seared. And the coconut oil stays solid until it hits the frying pan, where it begins to melt, just like beef fat. The burger has more protein, less fat and fewer calories than a patty that's 80 percent lean meat and 20 percent fat. And because it's plant-based, this "meat" has no cholesterol. The taste is unreal. When I tried a mini burger slathered in vegan mayo, mashed avocado, caramelized onions and Dijon prepared by San Francisco chef Traci Des Jardin at the company's headquarters in Redwood City, I was floored. The flavor was slightly less potent than meat, but if I didn't already know this burger was made from plants, I wouldn't have guessed it. The texture as I chewed was just like ground beef. I tried to get my hands on Beyond Meat's Beyond Burger for a comparison, but so far it's only available in Boulder. The aroma of Impossible's sizzling patty is also unmistakably meatlike. As it wafted through the office, the photographer I'd brought along for this story (a self-described cheeseburger enthusiast) cooed, "the smell!" Brown's team engineered that smell. First, the researchers put cooked meat in a gas chromatography mass spectrometry machine, which separates thousands of compounds. Then, they sniffed the meat via a tube, so they could identify the specific individual components of that meat scent. Brown says the researchers encountered smells like butter, maple syrup, a diaper pail, smoke, grass — even a raspberry bug. That last one was from a researcher who grew up on a raspberry farm in Vermont. "The smell of meat is the simultaneous exposure to these hundreds of different smells, and the smell of meat happens up here," Brown says as he points to his head. Food analyst Jeffrey Landsman says consumers love that sensory experience. "There is a real opportunity for food alternatives that taste, look and sound like the real thing and appeal to all five senses," says Landsman, a vice president at Specialty Food Sales, a company that markets and sells innovative food products to supermarkets. He says there's definitely room on the market for both Impossible's burger and Beyond Meat's Beast Burger, which he called "a home run." "The market has changed dramatically over the past 35 years and we've seen more and more meat substitutes," says Landsman. "Millennials especially tend to eat healthier, and in five years, they'll have families and will be the target market." But he says neither burger-substitute-maker should necessarily count on carnivore customers to drive sales. "I don't see it as a beef-eater market. I see it as an opportunity for the vegetarian market," says Landsman. "I don't think you're going to get people to convert over" and give up meat completely, he says. He adds, "As long as animal proteins are available at a reasonable price, people will not fully replace their meat with a plant-based alternative." Impossible's plant burger is still more expensive to produce than beef patties. But Brown says the goal is to increase production so the "meat" becomes less expensive than ground chuck. The company is already leasing a 66,913-square-foot manufacturing facility in Oakland to ramp up production. It will be several years before the startup makes enough meat to supply grocery stores, so right now it's focusing on select restaurants. (Beyond Meat, by contrast, is targeting grocery store shoppers with its Beyond Burger.) Impossible Foods wouldn't disclose which restaurants or say how much it'll charge for the burger. Brown says they are hoping that skilled chefs can devise complimentary flavors and help redefine what it means to order a hamburger. "If people are going to be eating burgers in 50 years, they're not going to be made from cows," said Brown. "We're saving the burger."